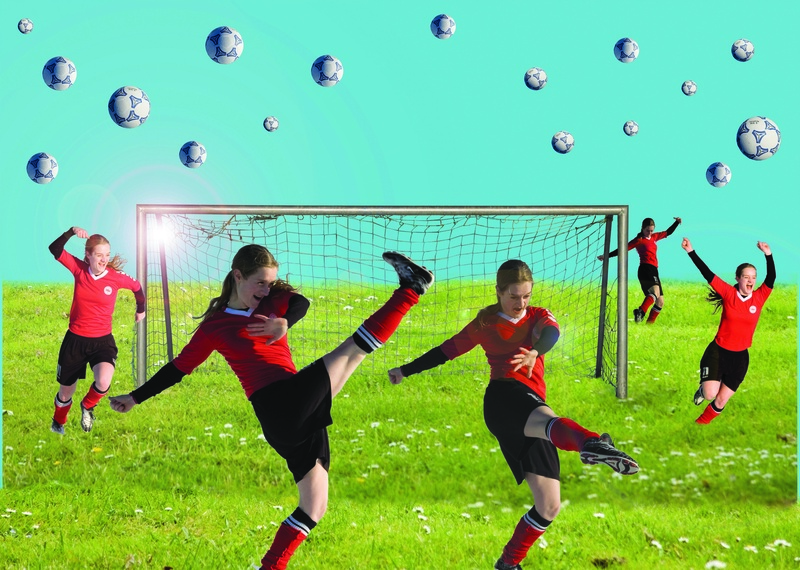 Football pitches us into gender-specific teams, and that’s the way we are brought up from early childhood: Boys play football and girls attend dance lessons. Boys clad in club gear revel in their idols and scoreboard victories, and male bonding brings gang-style hooliganism to the street as well as chummy hugs among fans on the grandstand. But what about the girls? Don’t they get it? Dance is like football: extremely physically demanding, fun and life affirming. And MTV would be nothing without cool cuts and moves. Now we ditch the team game and dribble the ball onto the stage, passing the ball to the dancers. Football ballet gains a whole new meaning when Beckham’s trickery takes to the stage in Kick-Off. The three dancers confront the audience directly and expect loud-mouthed crowd response. Gasping for air, the dancers comment on the pirouette they just muffed or the jump they only just managed to pull off. The worlds of dance and football fuse to create one team where the players have a good laugh at themselves and each other. Kick-Off performed at Teatret Zeppelin from September 6th – 17th 2006.